Going into the 2010 season, B-Rank (Bloomberg Sports’ proprietary ranking system), among many other rankings, tabbed Zack Greinke as a top-five starting pitcher in Major League Baseball. After his Cy Young season in 2009, it was easy to see why. Pitching for one of the worst teams in the majors, Greinke still won 16 games, and racked up 242 strikeouts in 229.1 innings. His 2.16 ERA was nearly identical to his 2.33 FIP (Fielding Independent Pitching) which suggests that he put up these numbers without much luck, and was dominant all year long. Thus far this season, Greinke hasn’t been anywhere near the top-five pitcher that many had hoped. For starters, he is just 1-8 through 13 starts in 2010. His ERA is nearly two runs higher than his 2009 mark. As was the case last season, his FIP (3.91) is comparable – as is his 4.18 xFIP (similar to FIP, but also strips out aberrant home run rates). While Greinke’s ERA and FIP are elevated, they remain better than average. But for most fantasy players, that is not enough. What they might fail to notice is this: Greinke’s 2009 season looks like the outlier. His 2010 performance looks very similar to what he’s done throughout the rest of his career. In terms of walks, Greinke’s BB/9 (walks per nine innings) of 2.03 this year is virtually identical to his 2.0 from a season ago, but still lower than his already impressive career 2.26 level. Another major difference from last year to this year is home runs allowed. The rightly allowed just 11 home runs last year in nearly 230 innings of work; his HR/9 was a microscopic 0.43. This year he has allowed 10 long balls – nearly matching his total from a season ago in about one-third of the time. On the other hand, his HR/9 in 2010 of 1.13 is much closer to his career level of 0.97 than the number we saw last year. Looking at his batted ball data – namely batting average on balls in play (BABIP) – Greinke has maintained a relatively normal BABIP in each of the past two years (~.318) when compared to his career number (.315). This further disqualifies luck from the equation. One slight change in batted ball data is the type of balls being hit. Greinke allowed 40% groundballs last year; that’s down slightly to around 38% in 2010. Conversely, his flyball rate is up nearly 4% year-over-year. With his HR/9 regressing towards a career norm, and more flyballs in general, it’s not surprising to see that his home run-to-flyball ratio (HR/FB%) jump from 4.5% last year to 9.0% this year. Again, the 9.0% is much closer to his career HR/FB% of 8.7%. When looking at pitch selection, Greinke is throwing more fastballs and change-ups while throwing fewer breaking balls than a year ago. This could be a part of the difference in the two seasons, but we’re talking a relatively minor 3-5% difference on most pitches. 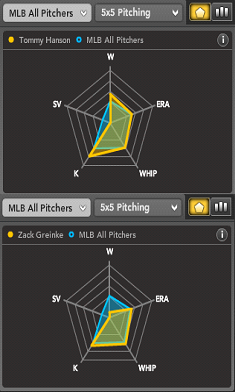 While the 1-8 record is not a true indication of Greinke’s talent level, his 2010 peripheral stats seem to be just that. Greinke appears to be a very good but not quite elite pitcher who enjoyed a career year in 2009. If you can use his name value to acquire a pitcher with similar peripheral stats and a greater chance at more wins (Tommy Hanson?) plus possibly an additional player, you could successfully upgrade your team.